An outline planning application for a residential development of 325 houses and apartments (including 70 extra-care units) has been submitted for the Lakeside site in Theale. The application number is 15/02842/OUTMAJ. The planning documents can be accessed by clicking here. "Cluster flats" are flats that share a kitchen or common room. I suspect that the 70 "cluster flats" make up the extra-care sheltered housing. Access to the site is proposed to be by both the existing (closed off) access off The Green and from the end of St Ives Close. The southern part of the site already has planning permission for 350 homes, including 5-storey blocks of flats. Although the application says "matters to be considered - access", many details are supplied that will set the scene for detailed applications. These details need to be taken into account now if you are considering any objections. I tried to table an amendment to exclude site THE009 (70 homes) in Theale, among others in Thatcham and Newbury, but this was ruled out of order. Council officers claimed that my amendment would negate the motion to approve the DPD. I disputed that removing four sites out of a total of 29 negated the motion but had to accept the Chairman's ruling. I then spoke against these sites in my speech on the main motion. The DPD has now gone out to formal consultation, which will close on 21st December. It is important for as many of you as possible to respond to the consultation. These responses, along with the ones submitted to the preferred options DPD last summer, will go to the planning inspector who has to approve the DPD before it can be adopted. Things have changed since the preferred options stage. It is important to comment on those changes and to support the rejection of the old Theale sewage works site, land at M4 J12, and Pincents Hill - the landowners/developers will be likely to try to get them put back in. The Council has now looked again at all the sites throughout the district as a result of the consultation and has produced a new version of the DPD as a result. The Council has removed some sites altogether and has changed the number of homes proposed for many sites. It has also put in sites previously rejected (though not in Theale). These sites are shown on the map below. So, whereas Theale was threatened with a total of 313 new homes, 85 are now proposed. However, some people who who live in The Green face the prospect of new housing sites both in front and behind them. There is a strong possibility that a new planning application will shortly be submitted for the two Lakeside sites (between The Green and the bypass). If this is approved then it is likely to include the 15 homes proposed for North Lakeside (THE003). The DPD is due to be approved by a special meeting of West Berkshire Council at 7pm on November 5th at St Bartholomews School in Newbury. Residents will be able to attend the meeting but will not be able to speak. The meeting will also be webcast on the Council's Youtube Channel. Assuming it is approved, this final version of the DPD will go out to consultation between 9th November and 21st December and then submitted to the Secretary of State. It will then be subject to an independent examination. It is likely to be adopted in about a year's time. Housing study finds that 665 new homes need to be built in ‎West Berks ‬each year. The study, a Strategic Housing Market Assessment (SHMA), looked at future needs across the whole of Berkshire and established the number of homes a year that will need to be built between now and 2036. It also proposed how those should be split across the six Berkshire councils. The study was produced by the six Berkshire local authorities and the Thames Valley Berkshire Local Enterprise Partnership and is intended to help shape local discussions about how many houses should be built and where. The study also looked at the need for affordable housing and what housing is needed for specific groups such as older people and communities. All the information collated will help West Berkshire Council prepare a new Local Plan. The Assessment can be access by clicking here. More delays to the building of the lifts and new footbridge at Theale station. It has now been decided that the project to build a new footbridge and lifts will be carried out by Network Rail rather than Great Western Railway (First Great Western as was). This is because Network Rail will be carrying out a lot of other work at the station in connection with the electrification and new trains. This work will include extending the platforms. Unfortunately, Network Rail will be re-tendering the project because of the length of time since the last tenders were received. Network Rail are hoping to have finished the re-tendering by mid March and to start work soon after that. We are trying to schedule a meeting with Network rail and GWR next month to discuss the situation. Mr. Eoin may not “give a fig” about the environment (Chronicle letters 8th Oct) but I hope that he cares about the air we breathe. Government figures show that nitrogen dioxide, the pollutant subject to VW’s defeat device, contributes to 23,500 deaths per year in Britain. Particulates, the oily soot produced by diesels, contributes to another 29,000 deaths. These account for almost one in ten of all deaths in the UK. We all live in, and affect, “the environment”. Everything that we do to it affects everyone. Tree work on Theale bypass embankment. I passed these complaints on to West Berkshire Council's grounds maintenance manager. 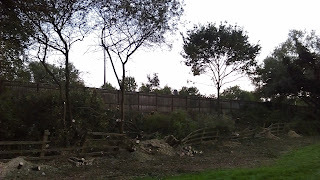 He had one of his officers visit the site and speak to the tree surgeon on Monday. They have agreed to pollard affected willow trees to six metres above ground level, rather than two to three metres, from now on. This pollarding will still look drastic, but the willows will re-grow quickly (like the ones at the end of Cavalier Close and opposite the library did). I have received a copy of a tree condition report that was carried out last autumn. This specified different treatment for different groups of trees, and individual trees, depending on their condition and location. Some willows are specified to be coppiced (cut down, but leaving a stump to form a base for re-growth). Again, these should re-generate quickly. 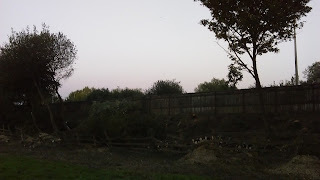 Trees growing between the noise fence and the bypass, growing within a metre of the fences or in the ditch are specified to be felled. There are also several trees that are to be felled because they are dead (including some elms) or are leaning. I attended a meeting of local councillors with the new store manager last week. She said that the store will open next summer. She said that they will recruit about 350 "co-workers" and that they will be attending the Reading Jobs Fair at The Hexagon on Oct 1st to start recruiting. They pay the Living Wage (the one monitored by the Living Wage Foundation, not the imitation created by George Osborne). She assured me that co-workers (staff) would be able to park in their car park - there is no separate staff parking. She also told me that they would consider a park-and-ride scheme during the first few months to avoid the kind of traffic gridlock that we have seen elsewhere. They are putting much more emphasis on home delivery, so its not so important for customers to drive to their stores. 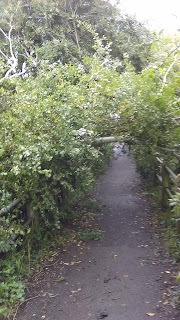 This tree was reported to me and to the Council by a concerned resident. I followed this up by calling the Council asking it to dealt with urgently as many people use the footbridge between Theale High Street and Pincents Lane to cross the M4. It is indeed good news that progress is at last being made on provision of affordable housing at Parkway, Newbury, and Taceham House, Thatcham. However, this should not deflect from the fact that Conservative-controlled West Berkshire Council must accept blame for the delays. The Council has taken six years to sell Taceham House to a housing association since it boarded it up. A poor legal agreement drawn up when SLI was given planning permission for Parkway meant that SLI were able to sell its private apartments for over two years while the 37 affordable apartments on the site stood empty. It's only sanction was to stop those sales. When the Council belatedly did so, it badly affected innocent buyers of the private apartments. Meanwhile, over one thousand families in real housing need have been waiting for a home. The site is in the triangle formed by the Theale bypass, The Green and Volunteer Road. The site currently has planning permission for 350 homes (80% flats) on the southern part of the site. This permission was given by an inspector at a planning appeal. The new proposal is for a total of 325 homes on both sides of the lake consisting of: a 70 unit extra care sheltered housing complex, 128 houses and a mixture of 3, 4, and 5 storey flats (60%). The density would be under 50 dwellings per hectare, compared to 78 per hectare under the scheme already given planning permission. Each house would have on-plot parking and there would be one parking space for each flat plus visitor parking. 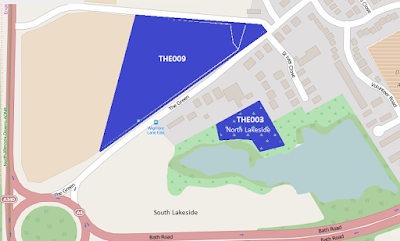 A new housing development is being proposed for the Lakeside site in Theale. The site is around the lake in the triangle of land between The Green, the Theale Bypass and Volunteer Road. The land south of the lake was given planning permission for 350 homes by a government inspector several years ago. The new proposal covers the land both south and north of the lake, which have been under different ownership. If it goes ahead, it will be instead of the 350 homes already permitted. The Pavilion is the building next door to the village hall and social club. Please pass this information on to your neighbours and friends in Theale. The agenda has been published for the meeting of Theale Parish Council meeting on 6th July. It can be viewed by clicking here. As usual, there is an "open forum for members of the public" early in the agenda. This enables residents to speak to the Parish Council about any matters in the parish, including those on the agenda. Please note that the agenda does not include a decision of the site for the new primary school. The special meeting of Theale Parish Council scheduled for June 30th, that was called to decide whether to release land on the North Street Playing Field for a new primary school, has bee postponed. This is because information provided to the parish council for that project appears to conflict with information provided to support the renewal of planning permission for the temporary modular classrooms. There are matters requiring attention before the next meeting of the Parish Council. The Chairman has therefore called for an extraordinary meeting of the Parish Council to be held in the Peter Gooch room, The Pavilion at 7.30pm on Tuesday 30th June 2015. 4. Members’ discussion about Terms and Conditions. West Berkshire Council agreed to provide further information about how they selected the North Street playing field as their preferred site for the replacement Theale Church of England Primary School at the recent public meeting. These can all be accessed by clicking here. The Council has, however, asked that information regarding compulsory purchase and the "hope value" of land that may be allocated for housing be kept confidential for the time being. The parish council has noticed some discrepancies in the information, particularly between the highways consultant's report and the other reports. West Berkshire Council have a project to replace Theale Primary School on a new site. The school is full and needs to be expanded to accommodate 315 pupils to cater for the number of primary school age children expected in Theale in 2017. The new school also needs to be able to expand to 420 pupils to accommodate children from housing that has been given planning permission and any new housing sites that may be allocated. The Council has allocated almost £7.5M for the new school. A significant amount of time was spent in trying to find a way to expand the school on its existing site but this proved to be not possible. Eleven sites around Theale were considered but only one proved to be viable. This site is on part of the “North Street” playing field. This is situated on the opposite of Englefield Road to the Village Hall. Please see this map. The field is leased by Theale Parish Council from the Englefield Estate and the parish council would have to agree to release five acres of the 13.5 acre field. The remaining field would be large enough to accommodate three full size football pitches. West Berkshire Council have produced this leaflet to introduce the project and describe how the proposed site was selected. I am very happy and pleased to thank voters in Theale for re-electing me as Councillor for Theale on West Berkshire Council. I increased my share of the vote from 56% in 2011 to 58% this time. Please click here for detailed results. Published and promoted by Tony Vickers on behalf of Newbury & West Berkshire Liberal Democrats, Ringway House, Kelvin Road, Newbury, RG14 2DB, Tel 01635 47375. Have you received your polling card from West Berks council? Polling cards for West Berkshire residents started being delivered last week. Everyone who was registered before March 1st should have received one by now. If you haven't received one, it may be because you have not been registered on the electoral roll at your current address. You can register on-line at www.gov.uk/register-to-vote. You need to be registered by 20th April to be able to vote in the general and council elections on 7th May. Friday Evening 10th April - Plane Off Full Carriageway - 2 Way Traffic Lights And Convoy Working. I have received an email from a resident of Blossom Lane saying a man knocked on her door saying her gable end needed fixing. She was suspicious and politely refused. Reputable tradesmen do not normally need to go touting for business. Please do not give business to people like this. You do not know how skilled they are and whether they will charge a reasonable rate. You do not know whether the work actually needs doing. This was a very lively meeting! Many residents spoke passionately about the need for a new school at the beginning of the meeting. Equally, many residents spoke with equal passion about the need to keep public open space. Several residents complained about the lack of notice about the meeting. It was explained that this was because West Berks Council had asked for a decision before Easter. There was also a delay in publicising the meeting because advice had to be obtained on whether such a decision could be taken during the election campaign. West Berks Council officers gave explanations of why their preferred site was on the North Street playing fields. However, residents and parish councillors felt that there were not fully satisfactory answers to all questions, particularly on planning, traffic and road safety. The Parish Council therefore decided to defer a decision and to organise a public meeting so that West Berks Council could fully explain their reasons for preferring this site and so that planning and highways questions to be fully answered. It is intended that the public meeting will be held after the school holidays but before the end of April. West Berkshire Council have asked for the public meeting to be put back to the second week in May. The exact date will depend on the availability of a suitable hall availability and of the appropriate West Berkshire Council officers. West Berkshire Council has approved the construction of a new, replacement, primary school on a new site in Theale. West Berkshire Council's preferred site is on the North Street playing fields, Englefield Road, which is currently leased by the parish council and used for football and public open space. Members to discuss whether the site should be relinquished and RESOLVE on any actions required. The proposed school site will occupy about 5 acres of the 13.5 acre field and it is anticipated that the remainder will remain as playing fields and public open space. The meeting will be open to the public and the first item on the agenda is an Open Forum for Members of the Public. The Conservative leader of West Berkshire Council has said that he was "delighted" with their budget. the cuts to the budget for short respite breaks "may increase the likelihood of family breakdown"
cuts to speech, language, physio and occupational therapies to children with Special Educational Needs may lead to "to provision falling short of statutory requirements and being open to challenge"
several of the cuts will cause services to "focus exclusively on children at the bottom of the edge of care, at risk of exploitation or those who go missing". cutting the budget of the Youth Offending Team "could lead to an increase in the number of young people receiving a custodial sentence,with potential associated non-avoidable costs to us [the Council] ". This team used to have one of the best records in the country. cuts to Educational Welfare "will mean less support for more vulnerable pupils and their families, with a negative impact on schools and standards". ceasing to commission the Children and Adolescent Mental Health Service "may lead to a reduction in effective support to highly vulnerable young people"
the reduction in training budgets "runs contrary to our [the council's] plans to invest in our workforce to improve the quality of social work with children and their families"
the reduction in capacity in school place planning and transport will negatively affect "a high pressure area". All the quotes above are directly from the Tory Administration's own budget papers. Food hygiene at one of the takeaways in Theale needs "urgent improvement"
As of 13th March 2015, the food hygiene rating for the Oriental Bar takeaway in Theale was "0 - Urgent Improvement Necessary". Please check these Food Standards Authority Food Hygiene Ratings for takeaways in Theale before you use this takeaway. The application was to demolish the skittle alley and extend and convert the pub to provide nine apartments. I have been informed that the applicant is likely to appeal. West Berkshire Council agreed their capital investment programme last night that includes investing £7,373,740 in a new school to replace Theale Church of England Primary School. This is good news for Theale as the current school is full. However, it will not be finished until at least the summer of 2017. There have been long unnecessary delays in the project and a site for the new school has still not yet been finalised. There will be lane closures on the Theale Bypass during the day on Thursday 5th March. This is for gully (drain) cleansing. Demolition work behind 40-58 Theale High Street is scheduled to start Monday 2nd March. Thi is in preparation for the development of 27 homes for the over-55s. The work may affect the access between Kaya's and Cropper's that leads to Cumber Hall and Leonard court. The bridge taking the A340 Theale to Pangbourne road over the M4 near Tidmarsh will be closed for repairs maintenance from Monday 2nd March to 13th March. I had a complaint from a resident about fly-tipping alongside the footpath that leads from North walk to North Street. I investigated and found broken furniture and a tyre had been dumped. I have asked the neighbourhood wardens to clear this. They may not be able to access the broken furniture, however, as this is behind a security fence. I also asked them to clear a small accumulation of rubbish from the footpath leading from Cavalier Close to Volunteer Meadow (the green area between the allotments and the bypass).